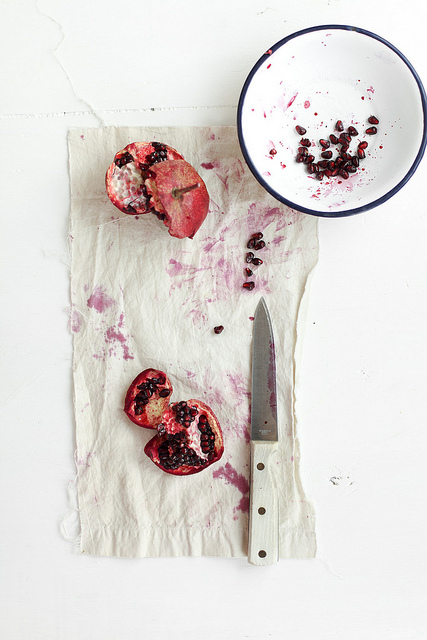 A Pomegranate — always with butter. I was given a few pomegranates about a week before I broke into one. I know I should have used them earlier, given that fruit goes bad so quickly, but I just didn't get around to it. So when I finally opened one up, full of mold. Damn it! I thought, what am I going to do now? So I decided to photograph them anyway. Destroying them was my method. 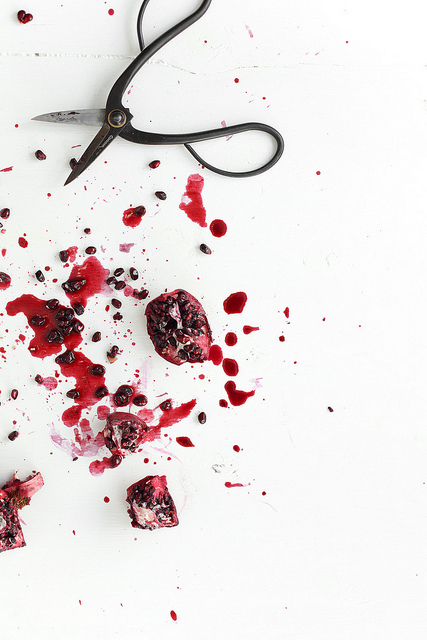 Ripping them apart, puncturing them with gardening shears, popping the seeds so the juice splatters everywhere. These photos are the end result. A bit gruesome, but in a wonderful way to me. Once I pierced one and the juice splattered everywhere, I immediately thought of the opening credits of the show Dexter. I haven't watched the show in years, only seeing the first few season that were available online. But I always loved the opening credits, making the perfectly normal foods into ghastly crime scenes. Besides this, it has been a pretty slow week. The shop is completely dead, so my coworker and I have to find stuff to do. So we have been trying out new recipes! Which has been pretty fun. I made chocolate drizzled honeycomb candy, sea salt and chocolate shortbread, and mocha hazelnut cookies. They all have been working out well so far. They were all recipes that had intrigued me but had yet to find time at home to make them. Hopefully the customers at the bakery will like them! We have been sampling out the honeycomb candy and everyone has been loving it, so that made me happy.